Once Again, You Did It! 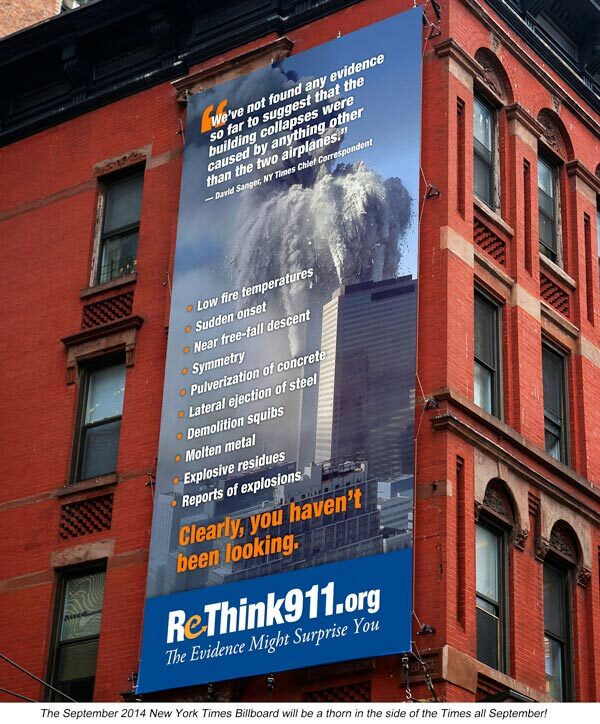 We at AE911Truth are delighted to announce that we reached our $30,000 fundraising goal for the September 2014 New York Times Billboard. We would like to thank the hundreds of people who contributed their hard-earned dollars toward this powerful and provocative statement on the 13th Anniversary of 9/11. Together we are making it impossible for the public and the powers that be to ignore the irrefutable evidence of controlled demolition at the World Trade Center on 9/11. Now we must work to ensure that this billboard draws all the attention it deserves, including a response from The New York Times Editorial Board. Stay tuned for important outreach efforts to happen this September, and thank you for being involved!